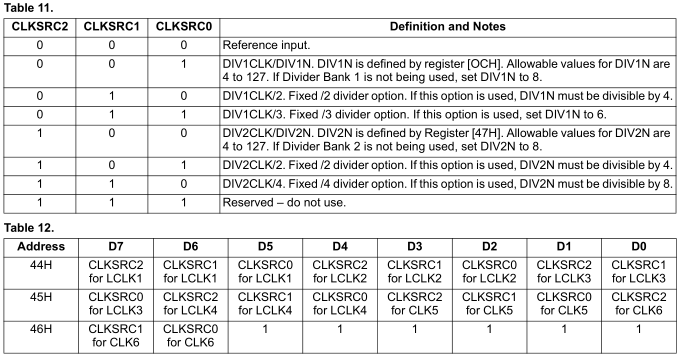 After we’re given the VCO, the datasheet says we need to select the divider 1 dropdown box as 6 for the divider of 3 to be enabled and shows 133 MHz as we wanted. We can now see which bits in each register need to be set, one thing that I found was wrong was the charge pump setting which should really be 001. The 16MHz crystal I’m using has an ESR of 50 ohms, so we’ll select 60 ohms, XDRV will be 10 so the register will be 00110000. 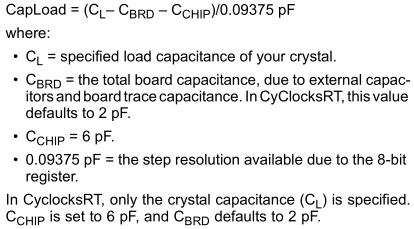 My 16MHz crystal has a load capacitance of 18pF. 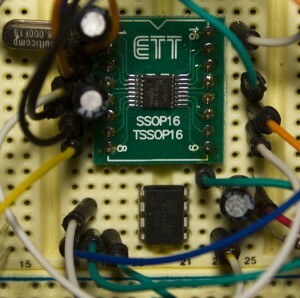 The formula we use is shown above however the Cyberclocks program can automatically calculate the correct 8 bit capacitance needed which in this case was 01101011. As I just want 1 output enabled as LCLK_1, we set this register to 1. 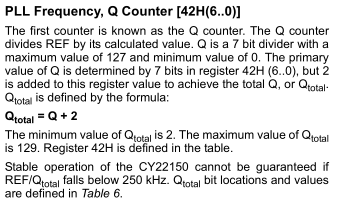 The first step in generating the PLL is the the Q counter which is used for dividing our crystal, in this case our Q counter is 16 which was given to us by Cyberclocks so 16 Mhz / 16 Q = 1 MHz. After Q counter, we multiply the result by P which Cyberclocks gave us a value of 399. We calculate Ptotal by using the formula above. In our case to generate 399 Ptotal, we do: 2 x (195 + 4) + 1. For the charge pump setting since out Ptotal is 399, we can use 001. Our registers will look like: 11000100 (40H) and 11000011 (41H). Since we need PO to be 1, we have to set this in 42H which now will read 10001110. Now that we have the 399MHz for the PLL, we’ll have to say that we want to use the PLL, so we set DIV1SRC to 0, otherwise our clock will come from the crystal directly. 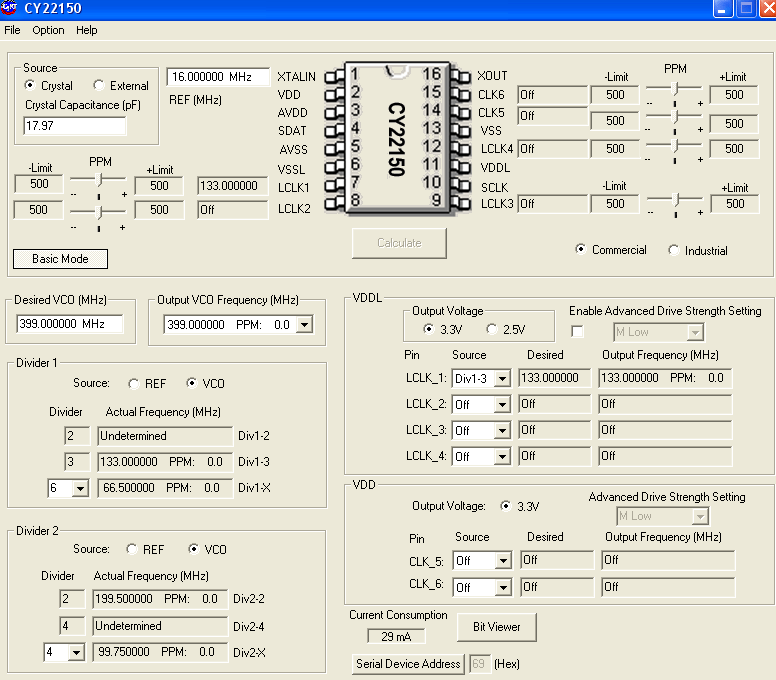 We need to divide our PLL by 3 to give us 133MHz, so we’ll need to set CLKSRC1 and CLKSRC0 to 1. Each clock output has it’s own divider too, as we are only interested in LCLK1 then 44H will be 01100000. As we used the fixed /3 divider it says we need to set DIV1N to 6, so 0CH will be 00000110. 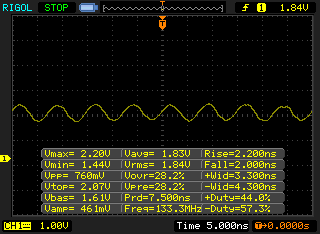 My 50MHz scope does show 133MHz though to be honest it was jumping around between 131 to 135 MHz but I believe this is because of the 50MHz scope, the breadboard and wires; measuring 50MHz works ok too. 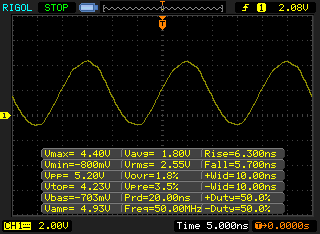 It seems to work well and it’s a easy part to use once you understand how it operates. insideGadgets © 2019 All Rights Reserved. 31 queries in 0.106 seconds.